Be the first to share your favorite memory, photo or story of Gertrude "Trudy". This memorial page is dedicated for family, friends and future generations to celebrate the life of their loved one. 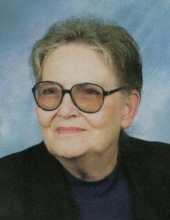 Miss Gertrude "Trudy" Victoria Chason, 84, died Wednesday morning , April 10, 2019, in Southeastern Regional Medical Center. She was born March 4, 1935 in Robeson County, N.C; a daughter of the late Haywood H. and Gertrude Simpson Chason. Miss Chason was a member of the Chestnut Street United Methodist Church and had served as a Stephen Minister. A graveside service will be conducted on Saturday, April 13, 2019 at 11:00AM from the New Hollywood cemetery with the Rev. Herbert Lowry, Jr. to officiate. The family will receive guests following the service under the direction of the Boles-Biggs Funeral Home. Surviving are a sister, Mary Brady and husband Charles; her fiancé; Louis Sufnar. She was preceded in death by four brothers, William Chason, Walton Chason, John Chason and Haywood Chason, Jr. In lieu of flowers, memorials may be directed to the Chestnut Street UMC General Fund, P.O Box 1464, Lumberton, NC 28359. To send flowers or a remembrance gift to the family of Gertrude "Trudy" Victoria Chason, please visit our Tribute Store. "Email Address" would like to share the life celebration of Gertrude "Trudy" Victoria Chason. Click on the "link" to go to share a favorite memory or leave a condolence message for the family.